Flow MTB rider Michelle took part in the first round of the Irish Gravity Enduro Series at Ballinastoe, Wicklow. Founded in 2011, the Gravity Enduro Ireland series is the original national Enduro series in Ireland with events taking place around the country. The format is relaxed and fun; with no transition times you can start the event in any order so it’s the perfect combination of competition and a great day on the bikes with your mates. It’s a two day event with optional practice on Saturday and the race only on Sunday. The course is approximately 25km long and each venue has its own unique terrain and challenges. There are 5, mainly downhill, stages running simultaneously and the person with the lowest accumulative time is the winner. Picking up 2nd place here’s Michelle’s race report. Setting out my goals for 2017 back in September, the Irish Gravity Enduro Series was top on my list of races to podium and race well in. Performing well on home turf, to me, is much more important than any international race, and it’s when I have the most fun! Preparing for this race had its ups and downs. I was very lucky to have two weeks off leading up to it, which meant that I could really ramp up my training as well as get cracking on that very long ‘to do’ list which is always a weight off the shoulders. Working and training full-time is always a juggling act, and definitely some things like family and friends take a back seat with me when I’m in full swing. It’s only when the holiday time comes, that I really get to catch up with people and everyday stuff, which makes me feel very guilty sometimes especially as I am not a professional racer. I’m sure some people find it hard to understand why one would devote so much time and energy to being an amateur but to me, it’s what makes me tick, drives me every day and keeps me working on myself like no other sport ever has. So, knowing I had this race report to write this evening and feeling that post-race fatigue and general lethargy, I began to ask myself questions on my way home from work this evening….Why do I love racing so much? Why do I want to always do well? Why is it so important to me? And what do I ACTUALLY want from it? The answers that came to me were all very simply, I just want to get better and I want to be the best possible version of me and to never feel like I didn’t give it 100%. I guess no matter how I perform in a race, whether good or bad, I always have a strong feeling that I can do better, be a better bike handler, be smoother, be faster, fitter, stronger, fuel better, train better. I have very distinct memories of having this feeling and this drive from a very young age when I played basketball. It has stayed with me throughout my life in every sport I have ever played, and mountain biking is no exception. And it’s not a feeling of wanting to be ‘Number 1’, I’ve never felt like that or had that desire, it’s more a case of a burning desire and drive to be the best that I can be, to feel like I am really reaching my potential and to never have regrets that I didn’t give it my all. I think its human nature to feel that way about a lot of things in life, for me it just happens to be in sport, and for the past four and a half years, mountain biking has been my passion. It’s there in everybody, it just comes down to whether or not you’re willing to put the effort in to achieving it. I don’t think I have ever felt that I could stop learning, there’s just no end to the learning curve, if you want it bad enough. And so it’s in racing, that I get this amazing feeling of sheer exhaustion and euphoria that can only be felt after a race run! Not to mention the high you’re on all weekend from meeting everyone and catching that contagious happy vibe that just puts your race nerves at ease…. until you get to the start line of the first stage! So getting back to my prep for this race, the first week of my holidays were great, I was training smart, eating smart and sleeping great. The second week however, was a little different. I only got out on the bike on the Monday of that week and for the rest of it it was a different type of playtime, this time on a SUP board down in Enniscrone, Sligo. Feeling like it was a much needed break from the norm, it did me a lot of good, but I came back feeling fluey and spent the next few days lying low and just resting up. By Friday I was feeling back to my normal self again and decided to hit the gym. Probably not the best idea the day before a race weekend, but I felt like my body needed a kick start and lifting heavy weights and low reps wasn’t going to fatigue me too much…. I was slightly wrong on this, the next day, although feeling as strong, my joints and muscles ached and were a little fatigued. Foam rolling, a hot bath and cold shower after the days practice was key to sorting this out and I spent the rest of the evening watching video footage of my practice runs from my Olfi. For me, it’s always the climb up to the first stage that those race nerves really start to kick in. I get the whole ‘jelly legs’ feeling and if I’m bad, my mouth goes really dry. I end up drinking all my water, which is no wonder I always have a tendency to need the toilet right at this moment, which is never ideal considering I’m stuck up a mountain, but as a half-hippy ‘vanlifer’ this is minor. Once the first stage is over, I usually find my stride and start to relax a little. This weekend was no different. Stage 1 felt okay but it was my worst stage time across all five. I settled into my stride afterwards and won the next stage. I dug really deep on Stage 3, never letting up on the pedalling, rode aggressively and kept it clean to pick up a decent time. After a long stage 3, we had a quick lunch stop and headed back up to crack on to the final two stages. I felt a bit of fatigue kicking in on the legs during Stage 4 and wasn’t as clean on this stage as I had been on the previous two but still managed a decent time. I hit Stage 5 with all guns blazing, kept it clean apart from one little slid out and pushed hard right to the end. I was 0.4 seconds off first! So tight! I was finished by 1.30pm so had the rest of the day to chill at the van chatting to people along the way, then back to the race village to wait for the pro men to finish and the podiums to commence. I had felt great on the bike today and the Transition was just an absolute joy to ride, especially on the many fast sections we were treated to. The Biking.ie crew put on a cracker of an event, they just seem to get better each year, no wonder it was a sell-out. With the podiums ready to go, I hear Leah is in and that I am just 13 seconds off the win and finished 97th out of 314 riders. It was a bitter sweet moment : ) Delighted to be so close to little pinner Leah Maunsell, but gutted to be so close to the win too! 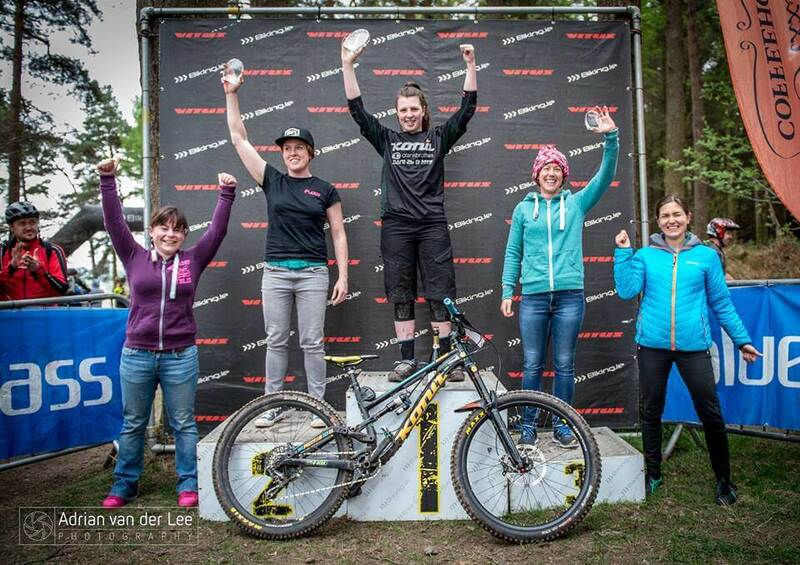 All the same, I was just so happy to come in second in such a stacked field of over 20 women, the best turnout there has ever been to an Enduro race in Ireland and testament to the efforts that are being put in by so many people to get more women biking. Till next race! Gotta keep on truckin!